Revit 2016 has been released and you can find various sources for information on the enhancements of the software. There are lots of nice changes, but I want to focus on electrical enhancements. Some were part of the UR2 release of Revit 2015 available to subscription users, but are included in Revit 2016 for all users. This information is not all encompassing, but will help those electrical users be aware of some things that will help them. 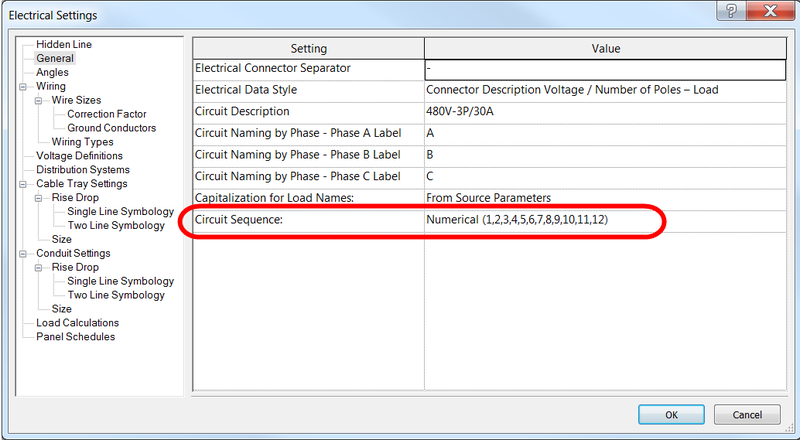 The Circuit Sequence feature gives the user some options for the sequence for creating electrical power circuits. This enables the creation of circuits that are grouped by phase. To set up the sequencing feature. Open the Electrical Settings window (via the Manage tab > Settings panel, MEP Settings drop list > Electrical Settings). On the left side, select General, then go to the Settings column on the right. Prior to the 2016 (and 2015 UR2) release, when you created an electrical circuit, Revit would automatically assign the circuit to the next available circuit number on the electrical panel which you selected for the circuit. To change the circuit number for the circuit, you needed to edit the electrical panel schedule by either highlighting the panel and selecting the “Edit Schedule” function from the ribbon or selecting the desired panel schedule from the Project Browser. You then used the Move Up, Move Down, Move Across to move the selected circuit to the desired location. This became more of a pain as the panel became more completed, and especially if you had 3 phase circuits which used 3 circuit numbers. When you add a power circuit, it will default to the last panel to which you assigned a circuit. This can speed up the circuiting process, but can also circuit to an incorrect panel, so be aware. I want the ability to specify the actual circuit number when creating a circuit. While this is good for design work, it is especially helpful for as-built work when you know the circuit number when creating the circuit. This entry was posted in General BIM, Revit Tips and tagged Autodesk, BIM, Building Information Model, Electrical, Engineers, Revit, Schedule, Standards. Bookmark the permalink. I want the ability to assign Alpha Numeric Circuit numbers. For example, in Australia panel boards are often divided into two halves – power on one side and lighting on the other. So we have circuit numbers P1, P2, P3 etc for power circuits 1-3. Similarly lighting is L1, L2, L3 etc. Currently the only work around is to create shared parameters, but then there is a risk of a disconnection between the actual circuit number and the parameter.